Why do I need a Pediatric Ophthalmologist? Children are not just small adults. They present with unique problems and require distinct management and treatment. Visual development occurs up until approximately age 9. Diagnosis of ocular disease must occur at an early age to avoid permanent visual deficits. Even intermittent or asymptomatic conditions can damage the visual system and must be addressed during childhood. Early intervention saves vision and demands an experienced and adept examiner. Communicating with a child requires special unique skills and training, as well as a good deal of patience and flexibility. 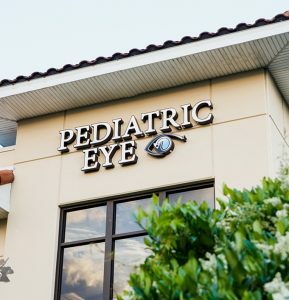 At Pediatric Eye Consultants of North Florida, we have adapted our office and our personnel to provide a fun and friendly environment in which children can feel at ease. We are comfortable with non-verbal children, children with developmental delays and those with physical or sensory handicaps. Each child’s needs are met individually and with utmost concern. Pediatric Ophthalmologists are a rare and special group of physicians. There are less than 1000 active members of the American Academy of Pediatric Ophthalmology and Strabismus (AAPOS) in the United States. To be an active member of AAPOS, one must complete one or two additional years of approved fellowship training following a 3 year residency in comprehensive ophthalmology. Members are certified by the American Board of Ophthalmology and must devote at least 75% of their practice to children and adults with strabismus. We are dedicated to the care of children and adult strabismus patients. It is what we do every day, all day. I’m an Adult Why do I need a Pediatric Ophthalmologist? Children grow into adults. Many ocular disorders of childhood persist or return in adulthood. These patients are best served by utilizing the skills of a Pediatric Ophthalmologist. Patients with a history of strabismus (crossed or wandering eye) or amblyopia (one eye with poor vision) may continue to experience problems as they age. Pediatric Ophthalmologists specialize in disorders of ocular motility and can offer both surgical and non-surgical treatment options. Even if surgery was performed in childhood, there may be available options for attaining ocular alignment. Adults who develop double vision, or ocular misalignment later in life should be evaluated by a Pediatric Ophthalmologist in order to determine their underlying diagnosis. Many acquired motility disorders are associated with systemic conditions such as stroke, autoimmune disease, thyroid dysfunction and cancer. Expertise in motility patterns is required to properly evaluate and manage such patients.